Plenty of new features of the modern kitchen are being previewed in this year’s trade fairs, demonstrating that the kitchen offers increasingly fertile ground for designers’ creativity. Kitchen furnishings, custom-designed islands, peninsulas and cooking areas are only a few of the units making up today’s kitchens, offering particularly fertile terrain for innovation thanks to the technical and aesthetic evolution of new generation materials. Surfaces play a key role in the kitchen, and every worktop, however large or small, must be selected with special care to respond to precise requirements for everyday use. In addition to timeless white and wood, the trendiest new kitchen countertops mark a return to dark colours, from total black to numerous dark shades of grey, including graphite and anthracite. High-tech ceramic is particularly appropriate for the requirements of today’s kitchens, offering a broad colour palette ranging from “absolute” black to a vast selection of hues adding a touch of charm and elegance. SapienStone, the Iris Ceramica Group brand of kitchen countertops, is a landmark on the contemporary kitchen scene. SapienStone’s resistance to scratching and blows, thanks to the properties of the Iris Ceramica Group’s non-absorbent, inalterable porcelain, fully responds to the need of kitchens that are used every day and must permit easy cleaning, maintenance and overall hygiene. The resistance of the SapienStone countertop permits preparation of dishes and ingredients directly on the worktop, resting kitchen utensils and cutting food right on the counter. And if acidic or chemical liquids are spilt, they will not damage the surface of porcelain, the only truly impermeable ceramic material. SapienStone kitchen countertops respond to the latest trends in the kitchen, exploring a vast range of different effects and finishes (such as stone, cement and marble) and a rich colour palette featuring a number of different dark colours. 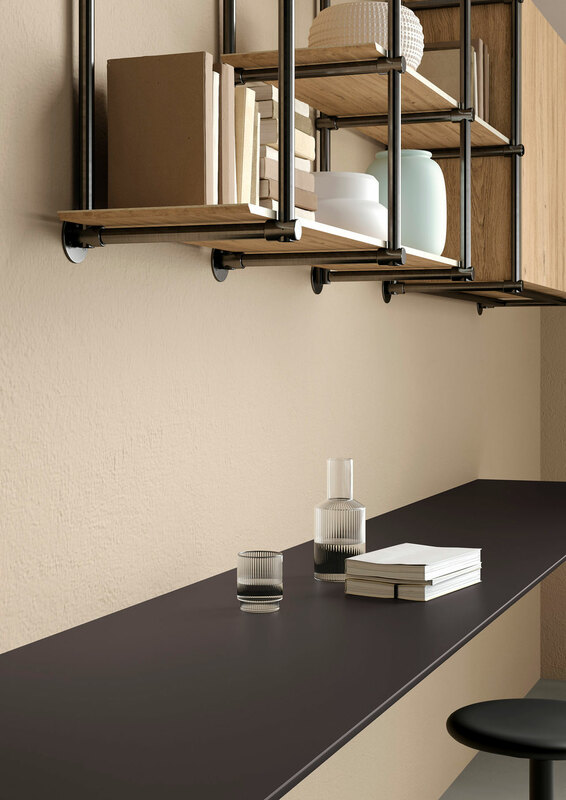 Noir is a new SapienStone surface with a monochromatic look that is "extremely versatile in stylistic terms suiting both traditional and modern kitchens". The principal aesthetic qualities of Noir and other black surfaces include the possibility of combining them with dark furnishings and accessories (including taps and kitchen cabinets) for a total black look, or alternating them with white for a playful contrast of surfaces. The gallery offers examples of this combination in a kitchen composed of Noir and Premium White. The kitchen style featuring a black countertop is a very trendy design solution in a casual, youthful mood incorporating a touch of luxury and personal elegance. Dark Marquina is a SapienStone texture with a black background "illuminated by thin white veins in a contrast designed for elegant spaces with a bold personality". Refined and intense, the Dark Marquina covering openly declares its inspiration in its name, identifying one of Spain’s best-known marbles. It was among the materials featured at Casa Decor 2019, an event held in Madrid, one of the world’s most important kitchen design shows. Situated on one of Madrid’s most attractive streets, the building that hosted Case Decor at Calle Núñez de Balboa 86 was constructed in 1925 and represents a noteworthy example of the type of home built during the Spanish capital’s urban expansion, to plans by Seville architect Carlos María de Castro. This was SapienStone’s second year in a row participating in the event, one of the world’s most important kitchen shows, where decorators, designers, architects, artists and enterprises "furnish rooms in the historic building, transforming them into a true product showcase". In partnership with Cupa Stone and Linea 3 Cocinas, SapienStone participated in Casa Decor 2019 with a kitchen featuring a Dark Marquina countertop. In the kitchen concept by Disak Studio, the various elements and modules revolve around a central island, underlining how the kitchen represents the central fulcrum of the home, of families and friendships. At Casa Decor 2019 Dark Marquina appeared with a polished finish underlining the depth of the black and the timeless look of marble.